Retrieving and enhancing one of the oldest skills of humanity, use the wooden and styrofoam mold technique, and a natural limestone aggregate, mixed with a dye and a common hydraulic binder, to cast a complex bloc of raw limestone. Then apply the ancestral finishing gestures of stoneworkers to give to your stone an aspect that perfectly meets the precepts of traditional local architecture. 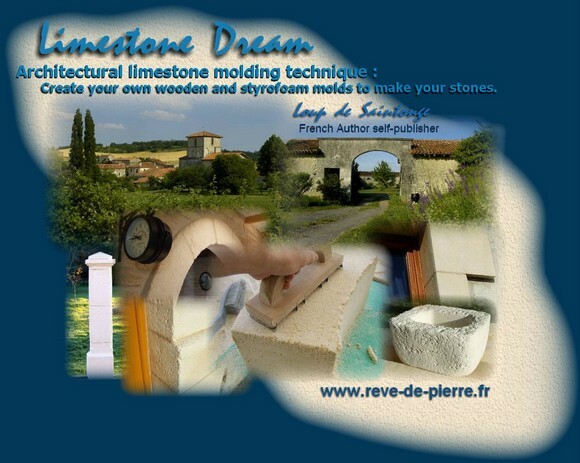 This ebook is a guide where you can find the recipe and the limestone mortar composition, the wooden mold technique, a set of wooden molds plans and a physical test method, to pour-in-place or to precast yourself french style architectural and decorative limestone blocks and slabs, for your house and your garden. Concept overview - Moulders Manual - Limestone Gallery - Molds Plans - Why this site ?